Photography: Amy Nicholas, Anindilyakwa Arts. Groote Eylandt looms surprisingly large through my window of Airnorth’s E120 on our flight from Darwin. The fourth largest island in Australia after Tasmania, Melville and Kangaroo, it measures 50 kilometres from east to west and 60 kilometres from north to south. 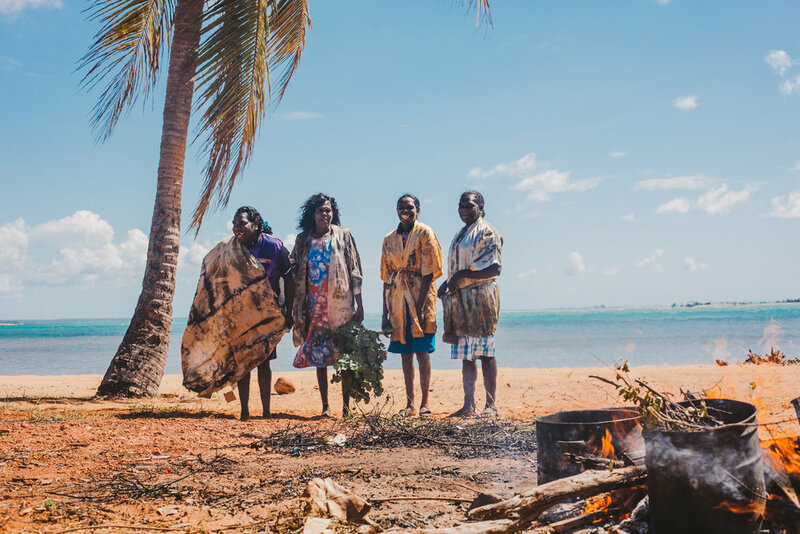 Part of an archipelago of 40 smaller islands, it’s home to the Warnindilyakwa people, whose Anindilyakwa language is thought to be one of the most ancient in Australia. Interestingly, it's also thought to be the first language spoken by all 14 Indigenous clans on the island. Ask around and you won’t find too many who have heard of Groote Eylandt (Dutch for “Great Island”) or know of its whereabouts in the Gulf of Carpentaria (off the east coast of Arnhem Land). The Anindilyakwa, as they are known, have lived here for some 8,000 years. Today Groote is home to 1,500 people across three main Indigenous communities: Angurugu, Milyakburra and Umbakumba. Around 400 years ago the Makassans were the first foreigners to set foot on Groote, when they began travelling from Indonesia in search of trepang (sea cucumber), visiting the island up until 1908. These days tourism is still in its infancy, and it’s multi-billion-dollar business GEMCO (Groote Eylandt Mining Company) — in operation since the 1960s — that keeps the island humming, producing more than 3.8 million tonnes of manganese ore a year. That’s around a quarter of the world’s requirements. Since manganese is a finite resource, it’s only recently that Groote — with permission of the local Aboriginal Land Council — has been opened up to the public, promoting itself as a world-class fishing mecca and welcoming involvement with its remote Indigenous communities. The arrivals hall of Groote’s rustic airport is a hive of fluoro GEMCO safety vests, plus a cherry welcoming sign and another that proclaims Groote Eylandt cane toad-free. Making his way through the sea of fly-in fly-out miners is my driver, who escorts me to a four-wheel drive for the ride to my accommodation at Groote Eylandt Lodge. Set in extensive grounds and linked by timber walkways, the Lodge is made up of 60 waterfront suites, plus a spa, fishing lodge and pool. My prior knowledge of Groote, I confess, was a little deficient. 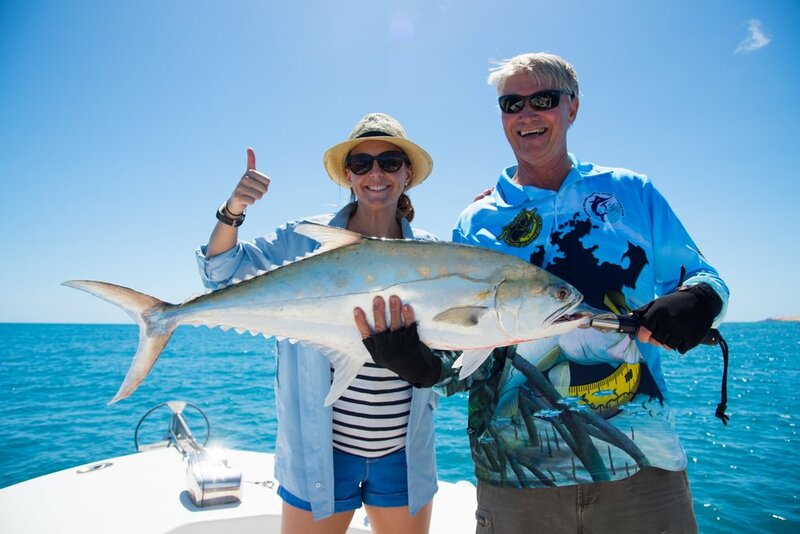 I’ve come for an outback adventure and to try my hand at fishing, having heard that even a novice like me can drop a line from one of two luxury fishing boats — East Wind and West Wind — to have the fish jump with gay abandon right onto the end of your hook. Swimming in the sea isn’t an option, unless you want to dodge crocs and sharks. “Don’t worry about the crocs; it’s the sharks that are the problem. There are hundreds of ’em!” warns Scotty, our Indigenous guide. And he wasn’t wrong — I kept hauling in reef sharks whenever I cast out my line! Still, when fishing’s over for the day, there’s always the Lodge’s swimming pool for a relaxing dip, and the romance of standing on the sundeck overlooking the Arafura Sea at sunset, with fresh sashimied fish and a flute of bubbles. Then you know you’re standing somewhere special. In a place where its people fully embrace their ties to the land, the Art & Cultural Centre is a key attraction on Groote, located on the grounds of the Lodge. Here, cultural heritage is explored through all kinds of traditional art, such as painting and basket and mat weaving, and it’s a place where guests can meet with local Indigenous artists whose work is highly prized by collectors all over the world. The Anindilyakwa pride themselves on hospitality, and their welcoming of arriving guests is warm and insightful as they introduce us to their art and culture on a tour of the gallery. 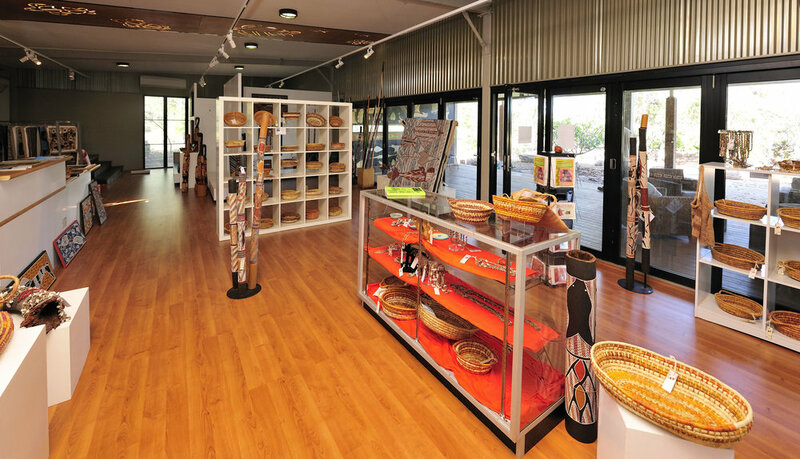 It’s from the gallery that four-hour ‘Explorer’ and half-day ‘Cultural Highlights’ tours take in Groote’s rich heritage, teaching visitors about the history of the Anindilyakwa people and language, clans, bush medicine and local art. On my tour with Scotty I’m struck by the diversity and unique nature of the environment. In this relatively small area rugged sandstone plateaus meet monsoon vine forests, and open woodland, paperbark swamps and red sand hills lead to pristine beaches. Our tour stops by open-air St Andrew’s Anglican Church in Angurugu, where Mildred Mamarika is a local Indigenous church leader. From here, we weave our way along a circuitous, bumpy track to arrive at the ancient cave-painting site Wurrwarpatena, decorated in ochre with all kinds of local wildlife and symbols, all still in pristine condition. So that cultural knowledge, traditions and skills are not lost by younger generations, schools and Indigenous rangers on the island have partnered up to establish the ‘Learning on Culture’ program, which seeks to ensure that the stories of Groote — like its cave paintings — live on. The Church Missionary Society was largely in control of Groote’s affairs up until 1978. In 2006, the Anindilyakwa Land Council took responsibility for the oversight of Anindilyakwa language work, and today it works to promote and preserve it through a collection of language and cultural resources relating to the Warnindilyakwa people. The magic of Groote Eylandt and its people will surely sing me back again one day. Airnorth flies to Groote daily from Darwin. 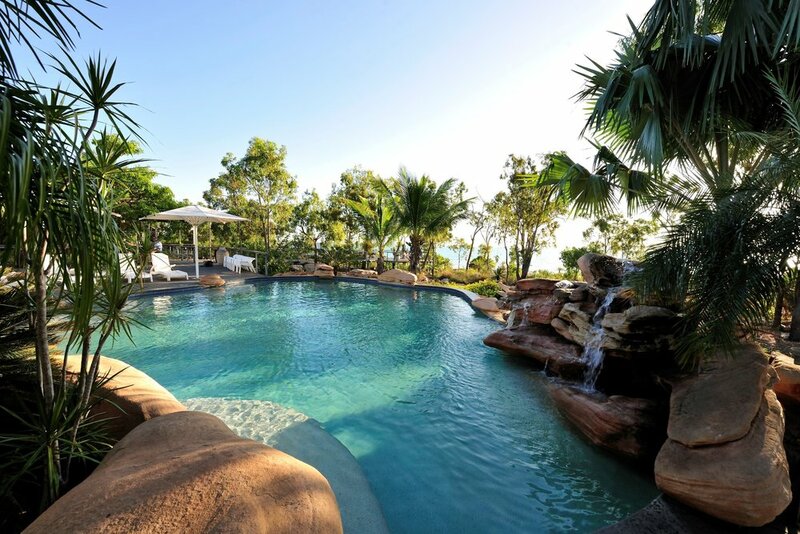 Groote Eylandt is the fourth largest island in Australia, and the largest island in the Gulf of Carpentaria. Groote Eylandt is Dutch for “Large Island”, and it was the name given by explorer Abel Tasman in 1644.